Honda is credited with creating the automatic scooter market in India and it has a near-stranglehold on the market. 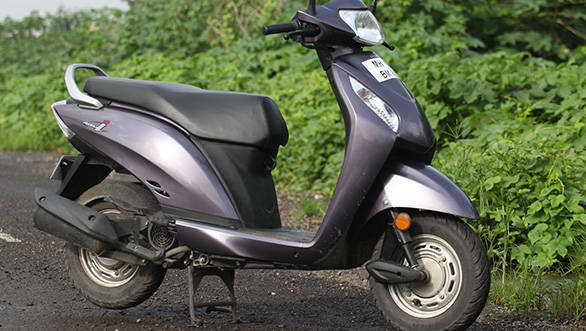 More than a decade since it came out, the Activa continues to fly out of showrooms. The wait times are long, dealers openly hint at premiums to rush deliveries, and the new plant and production lines are only going to ease the rush over a period of time, not immediately. However, compared to 10 years ago, the competition is much tougher. Every manufacturer has one or more scooters on offer. So, we were expecting Honda to create something dramatic to ensure their lead in the market stays, and what they have launched recently is this, the Activa i.
Honda bill the scooter as unisex but we disagree. The Activa i is a distinctly feminine looking product thanks to its slim styling and prim design. However, we don't think it is an especially good looking scooter specifically from the front. The proviso with styling is always that your aesthetic sensibilities may not align with ours, of course. What is exactly as expected is the build quality and the finish levels which are as good as we have come to expect from Honda. This doesn't mean it's amazing though. There is scope for improvement but if you use the Activa as a reference, the Activa i is nearly as good in the finish and build departments. 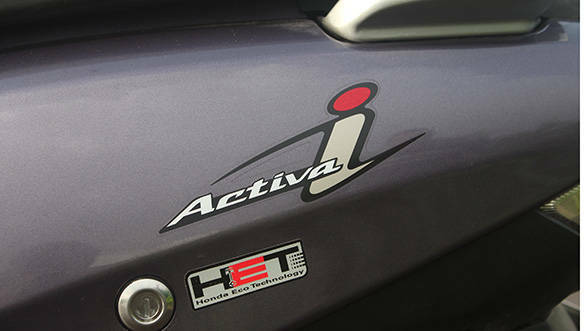 The Activa i's underpinnings are the same as the Activa so it is a known, proven powertrain. In use, the Activa i starts up quiet and refined and performance is good in traffic. We were surprised to note that when ridden flat out (top speed is 75.2kmph) the engine doesn't like it. You can feel a sense of harshness coming through which is completely unexpected. We were also surprised to see that the top speed is nearly 10kmph less than the Activa so maybe our test unit had an issue. That said, most users will never actually see the top speed of the Activa i in normal use so it isn't a deal breaker. In terms of actual performance, the scooter is a hair slower than the Honda Activa despite the scooter being slightly lighter. The Activa i also returns 56.3kmpl in the city cycle, which again is close enough in the ballpark (actually 1.2kmpl more than the Activa) to not matter in the decision matrix. The Activa i is quite nimble, as are all the 100cc scooters in the country. 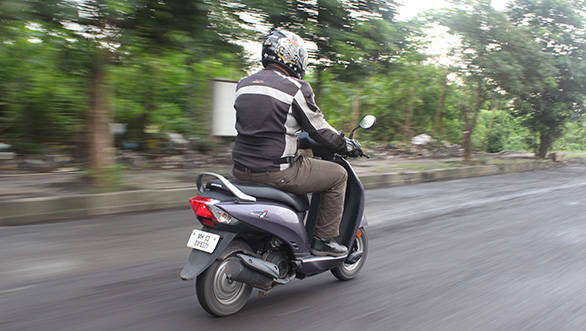 In traffic, changes of direction are swift and immediate and the rare chance when you get to keep the scooter leaned over for some time through a long corner, it feels up to the task though not as cheerful as, say, the Suzuki Swish or the Vespa. The big surprise is the ride. We know that telescopic forks work far, far better than Honda's trailing link forks but even then the Activa i made heavy weather of Mumbai's monsoon shattered roads on our test. Bumps really upset the scooter and even small ones like the painted rumble strips Mumbai seems to deploy every-freaking-where upset the scooter a fair bit. We were surprised because the Activa, which has the same suspension, actually handles these quite a bit better. On good, smooth roads there isn't an issue but on bad roads, the Activa i quickly descends into a nervous, juddery state. On the other hand, braking was surprisingly good. 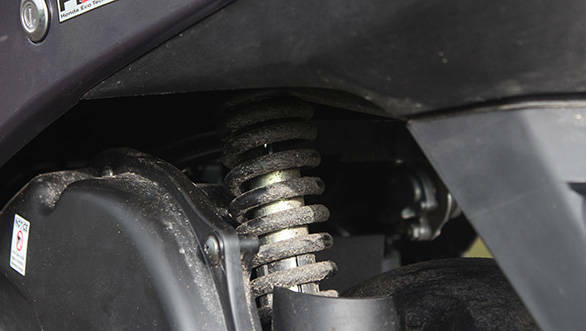 We have never liked having to panic brake on the Honda suspension format because if you trigger the anti-dive it can transfer weight backwards right at the end, increasing the risk of a front lock-up. But with the new CBS, the Activa i is one of the most assured stoppers among the Indian scooters. The Honda Activa i's narrow design shows up as a cramped footboard which is flat but simply not big enough to carry big bags. 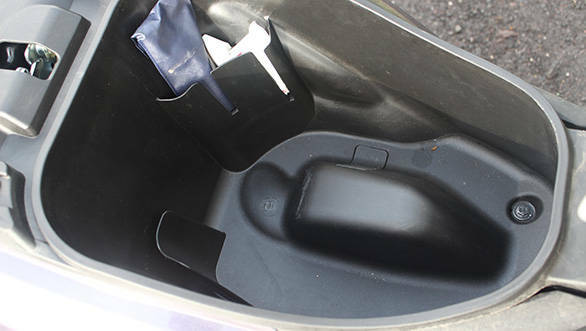 Honda also gives the fewest convenience elements, whether it is the front filler cap you are talking about, or a front storage cubby. Hell, Honda still list the side stand and front numberplate as an optional accessory which really is too much. Or in fact, too little. 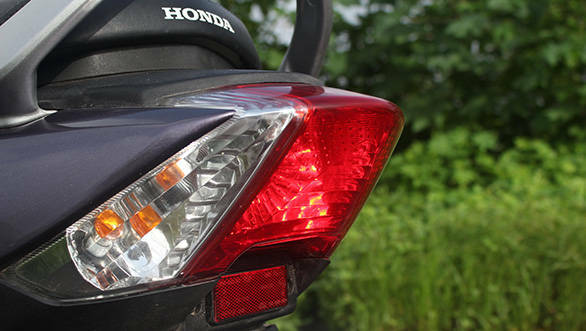 Honda have decided to take on the competition offering a significantly cheaper alternative to the Activa with the Activa i priced at Rs 53,041 on-road Mumbai, Rs 3,400 less than the Activa. The Activa i is a fairly effective scooter but based on previous tests, Honda is once again playing it safe. As a market leader you expect them to do more, but again, safe is a strategy that has worked rather well for the Japanese company repeatedly. The trend in the scooter market is to have a scooter for women and one that is unisex or male. 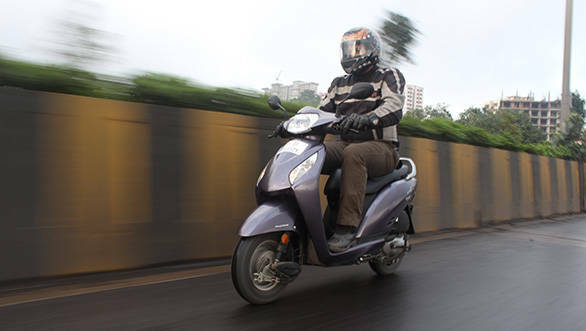 In the Honda range, the Dio (youth) and the Aviator (men) still can't match the Activa (unisex or male  though it sells so well, you could call it universal). The Activa i completes the range as the scooter for women. This is not the only move Honda is making to ensure its market share lead is not lost. Rumours are that Honda will soon launch another scooter with a 125cc engine, probably also called Activa to open a higher-end still unisex position in the market.